Funny Business the Musical | Blakyak Community Theatre co. This fast-paced, comedic romp through office culture features a catchy, original pop-musical score, and five unforgettable characters that you’re bound to recognise from around the water cooler. 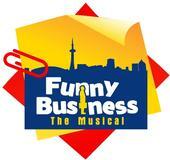 An exciting and fun new musical, Funny Business is the perfect production for cubicle dwellers and blue collars alike. This quirky and cute modern musical is brought to you from Chime Communications Canada, where five ordinary office workers must mount a team-building talent show to save their jobs. Meet Stuart, the lovable yet inappropriate office manager; Marcus, the smooth talking sales rep; Diane, the tough as nails marketing manager; Brie, the perky and scheming receptionist; and Jack, the awkward guitar-playing intern. Together, they must use their hidden talents to sing, dance and manipulate their way through the talent show, which ultimately degenerates into an every-man-for-himself battle of office skills, where only one will walk away without a pink slip. Featuring a sales versus marketing salsa, a foul-mouthed printer puppet, and more office backstabbing than HR can handle, the team must learn to keep it together without tearing each other apart. The production will be staged in the studio space at the Subiaco Arts Centre. Dates are July 7, 8, 9, 13, 14, 15, 16.